Njaan Salperu Raman Kutty (2004) Ramankutty (Jayaram), a teacher in the village school is known as “salperu” (i.e. good reputation). 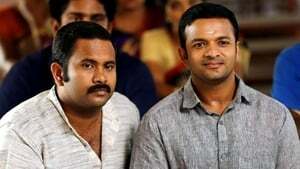 Ramankutty’s uncles- Narayanan (Janardhanan), Madhavan (Jagathy Sreekumar), Velayudhan (Laloo Aalex) and Shankaran (Manianpillai Raju) are in a competition to get Ramankutty to marry their respective daughters. Ramankutty agrees to marry his uncle Velayudhan’s daughter (Karthika). Madhavan’s daughter Sangeetha (Gayathry Jayaram) arrives from Mumbai and seeing her, Ramankutty changes his mind. On the eve of the marriage Ramankutty’s reputation is shattered. Life becomes hell.